--THIS ARTICLE IS FROM 2007. SADLY WE HAVE BEEN INFORMED THAT THIS KIND GENTLEMAN IS NO LONGER THERE ON A DAILY BASIS-- This shop's name is "Chaiyo" which has the same meaning as "Cheers" in English, and it's been the same for over 20 years (the owner moved here in 1986). 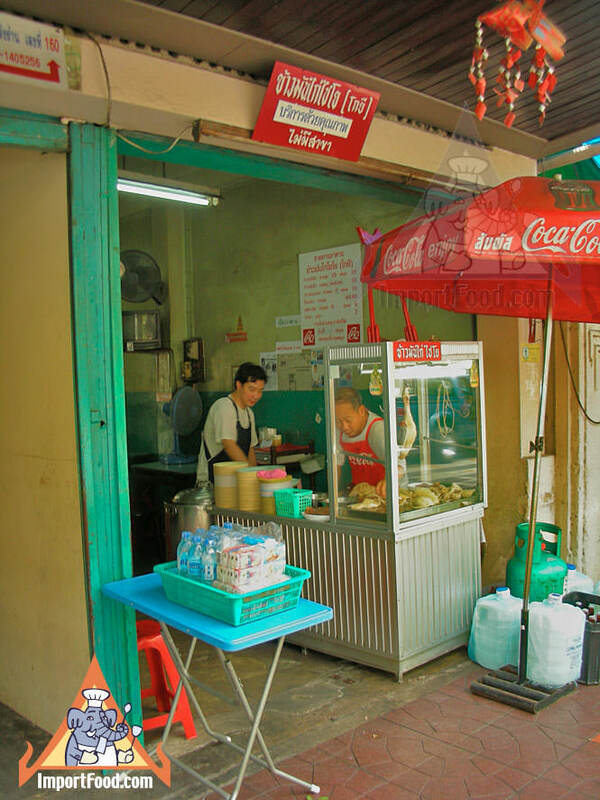 Things change slowly in Bangkok, successful shops with high quality food may stay the same year after year--and this is an excellent example. If you're in the area, don't miss it! The tiny shop has just a half-dozen tables, and laminated newspaper articles on the wall praising the food. 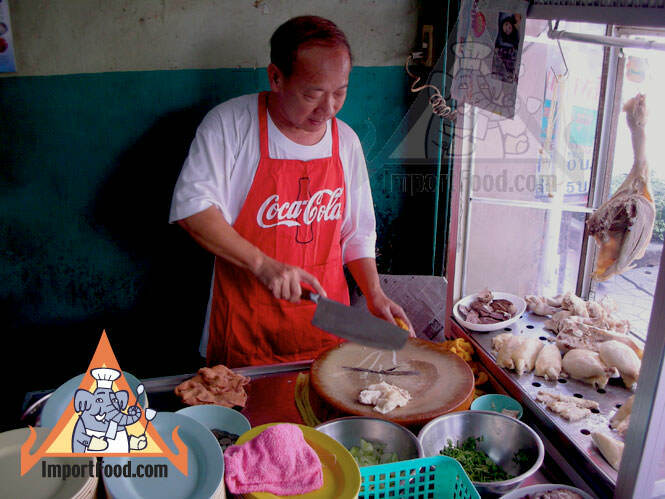 Day after day Chaiyo serves outstanding quality khao man gai, made in front of your eyes with chicken that couldn't be fresher. See our recipe for khao man gai. This is a true family business, as his wife and son (seen in picture) are always there to help serve guests. He's a friendly guy and in the course of our conversation mentioned that even though he's never had a passport he loves California and dreams of going there someday. 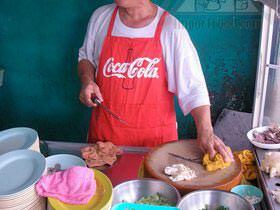 The chicken tastes great here, a standard order is 25 baht (about 75 cents). For an extra 5 baht, we highly recommend getting one of his unique specialties "Prik Khing" (it's one of the few things on the menu sign in Thai posted on the wall, you have to ask for it). 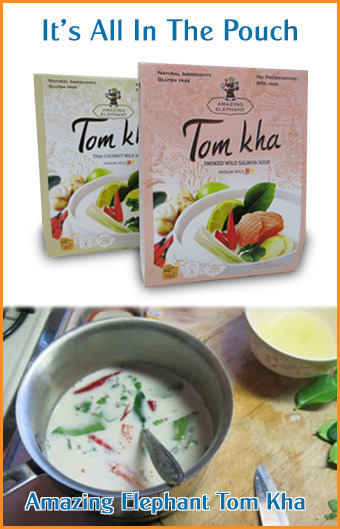 The prik khing is a small dish consisting of, on one side, finely minced fresh chile, the other side finely minced fresh ginger. 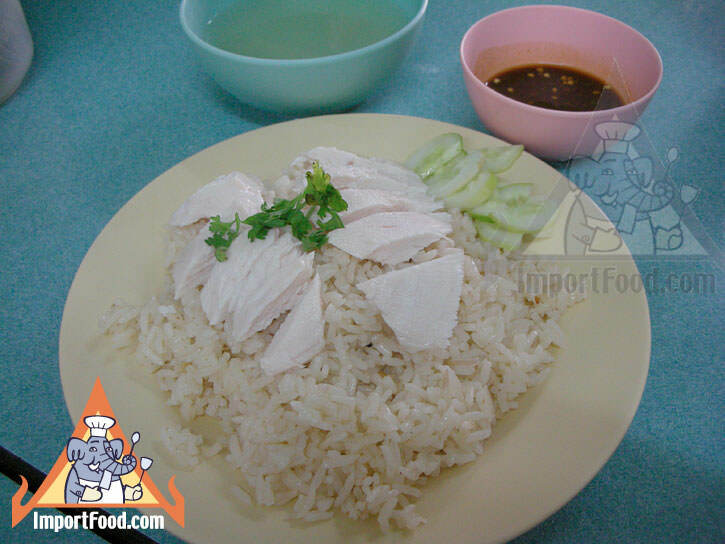 Spoon the prik khing into the black soy sauce and stir it up, then pour over your khao man gai for a wonderful flavor. As you walk down the sidewalk of Dinsor Road, away from City Hall, look on the left side--green doors and red sign above with white letters (see picture). . See our free map! 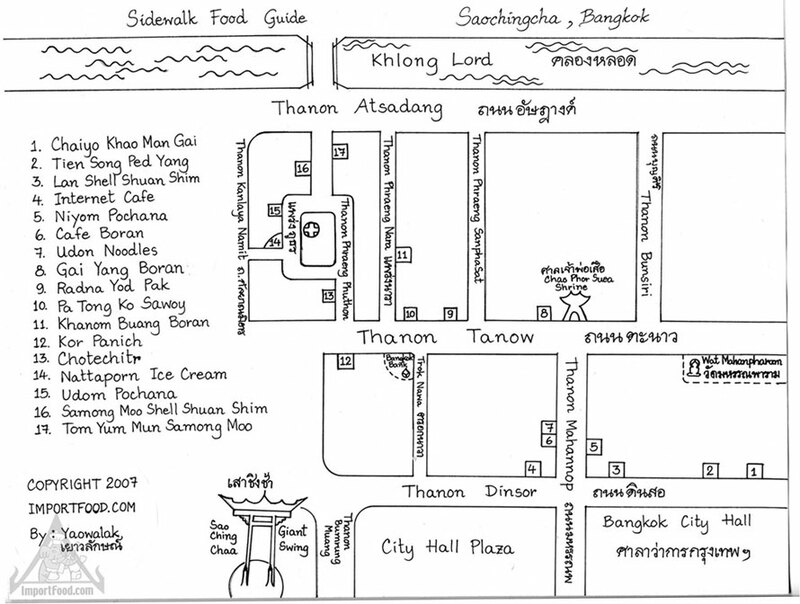 Or Click Here To Download The Free Map in PDF format.